In creating my body of work I aimed to mimic the colourful and polished appeal of advertising. By juxtaposing this with the words, “I want everything”, I intended to critique the unsustainable culture of consumerism evident in contemporary society. Through collecting and using discarded, children’s plastic toys the emphasis of the artwork is on the growing materialistic values of children and the manner in which a sense of satisfaction is unobtainable. This idea can further be extended to demonstrate society’s utter consumption and consequent lack of appreciation and value for what they already have. 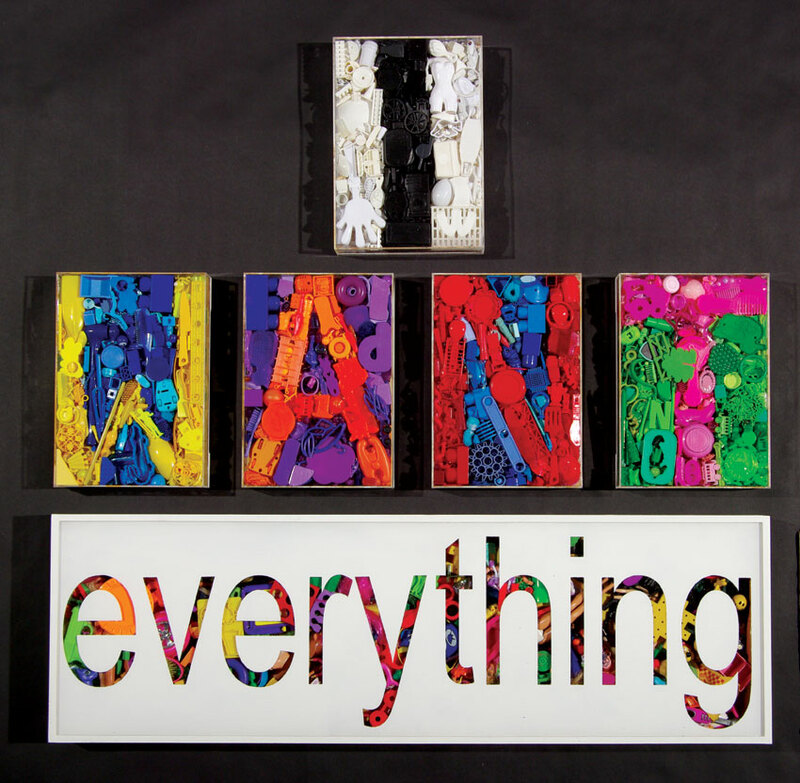 Rose Ayres has made a clever and humorous statement about our unsustainable consumer culture in a postmodern society. Identify the key materials Ayres has used. Where would these have been found or collected. Would you classify them as art materials? Why would Ayres have used these materials instead of photographing, drawing or painting them? Assess if this decision makes the work more or less compelling for the viewer. Collect examples of print media advertisements. Investigate how colour and text are key design elements to engage and persuade the consumer. How has Ayres has incorporated these same strategies and why? Suggest how the range of materials available to the sculptor has changed over time. What is a found object? Research work of Marcel Duchamp, the modern artist who first used them. How did this change the concept of what an artwork is? 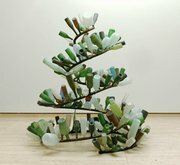 List what Tony Cragg’s Spyrogyra is made of. Would you class his materials as found objects? Cragg’s work is a reference to Duchamp. Explore what this might be. Propose other reference to modern artists and their practices in both artists work. Even though both artists did not make the objects in their artworks, they did make their artworks. Define step by step this process for each work. Discuss the role of the artist in works like Ayres’ and Cragg’s, considering both material and conceptual practice. Investigate the postmodern idea that an artwork can be both the subject and the object. Discuss what this means. Would you categorise Ayres’ and Cragg’s work in this way?